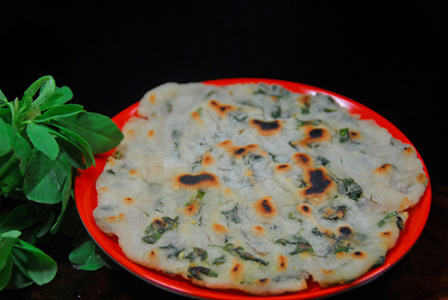 Fresh fenugreek leaves are boiled in water for few seconds and rice flour is added to it to form a soft dough. 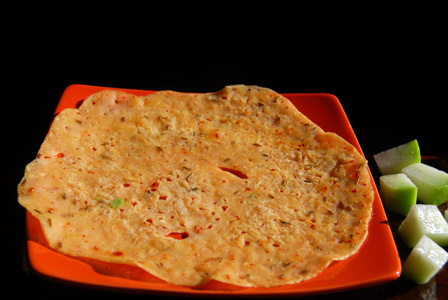 The freshly prepared dough is spread on flat pan into thick rotti and fried till its golden brown on both sides. Serve fenugreek leaves rotti with simple garlic pickle or with any chutney or pickle of your choice. Wash fenugreek leaves with water and keep aside. Bring to boil half a cup of water in a sauce pot, add salt, green chile and fenugreek leaves. Boil for around half a minute and remove from heat. Add cumin seeds and rice flour to the sauce pot and mix well. Add little more water or rice flour if necessary to make a soft dough ball. When pan gets little warm, grease the pan with few drops of oil and place the dough ball on the flat pan. Press the dough and spread it with help of wet fingers into thick rotti (around 8 inch diameter). Serve fenugreek leaves rotti with simple garlic pickle or with any chutney or pickle of your choice. Other Names: Fenugreek Leaves Rotti, Menthi Kura Tapala Rotti. Cabbage is shredded and is boiled in water. Rice flour is then mixed with cabbage and green chili. The freshly prepared dough is spread on flat pan into thick rotti and fried till its golden brown on both sides. Serve cabbage rice flour roti with lemon juice pickle, Click here for recipe of lemon juice pickle. Makes: 1 Cabbage Rice Flour Roti. Remove stem, wash and chop the green chile into small circles. Bring to boil around 3/4th cup of water, add shredded cabbage, green chiles and sufficient salt. Let the water bubble for a minute and remove from heat. Add rice flour to the above pot and stir well. Add little more rice flour if necessary. When warm enough to handle, form the dough into soft ball. 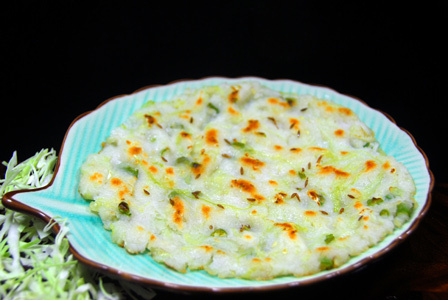 When pan gets little warm, place the cabbage rice flour dough ball on the flat pan. Press the dough and spread it with help of wet fingers into thick rotti (around 7 inch diameter). Sprinkle cumin seeds and pour a tsp of oil on and around the rotti. 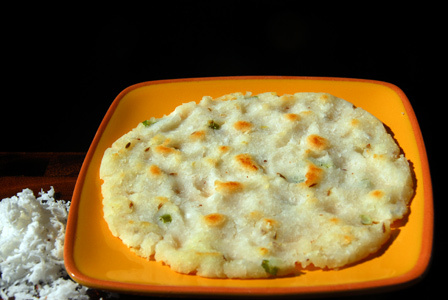 Serve immediately cabbage rice flour rotti with lemon juice pickle or with any chutney or pickle of your choice. Other Names: Cabbage Rice Flour Roti, Cabbage Tapala Rotti. Coconut is added to water and boiled. Rice flour is then mixed with coconut water. The freshly prepared dough is spread on flat pan into thick rotti and fried till its golden brown on both sides. Serve coconut rice flour roti with lemon juice pickle, Click here for recipe of lemon juice pickle. Makes: 1 Coconut Rice Flour Roti. Bring to boil around 3/4th cup of water, add grated coconut and sufficient salt. Let the water bubble for few seconds and remove from heat. When pan gets little warm, place the coconut rice flour dough ball on the flat pan. 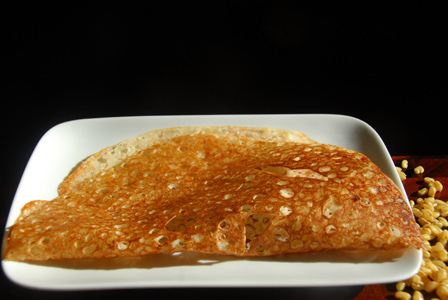 Serve immediately coconut rice flour rotti with lemon juice pickle or with any chutney or pickle of your choice. Suggestions: If the roti is still sticky inside, put it back on heat and cook on low flame till little crisp and well cooked . Other Names: Coconut Rice Flour Roti, Kobbari Tapala Rotti.